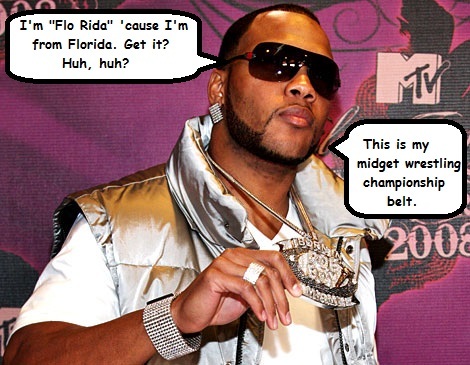 Am I Not Hip Too, Flo Rida? Is it any surprise that I am not a big fan of rap and hip hop? Frankly, once Snoop Dogg changed his name to Snoop Lion I just got lost. If Snoop Dogg could change his name, where would it stop? Would the President become Barack Lion? It was so confusing. Snoop’s name was dumb to begin with, now it is just stupid. Hey Snoop! Lay off the pot. But rap and hip hop are full of lousy names. Yesterday, Allan Keyes introduced you to Li’l Poopy. SERIOUSLY? Is that any better than MC Pee Pants? At least Mr. Pants is a cartoon character. Li’l Poopy is about to be the centerpiece of a child welfare case. Ok, so I’m not on the tip of the hip hop cutting edge, if you know what I mean, and based on that mixed metaphor you may not. All this brings me to Tramar Lacel Dillard. Who? You may know him better by his nom-de-dumb, Flo Rida. If I were a rapper I’d pick MC Fred Mertz before that. Seriously, I don’t care if it is some play on “flow rider,” which isn’t so hot to begin with, the guy is from Florida so he calls himself Flo Rida and that is just silly. 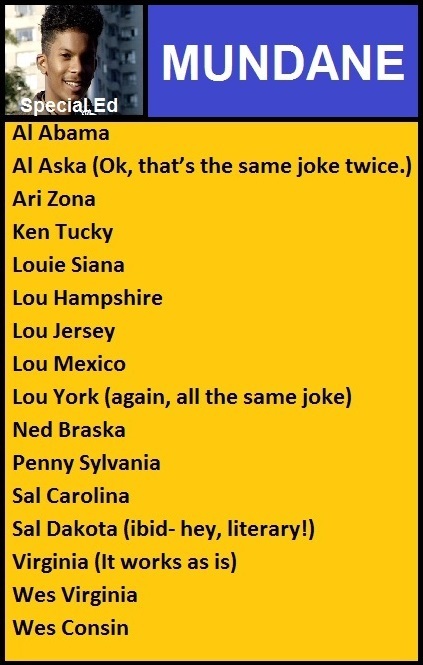 So I, with nothing but time on my hands and no life, went through all 50 states and from that culled a list of Flo Rida-style names, which I’ve sorted into three categories: Mundane, lame, and Hip Hop Tastic! 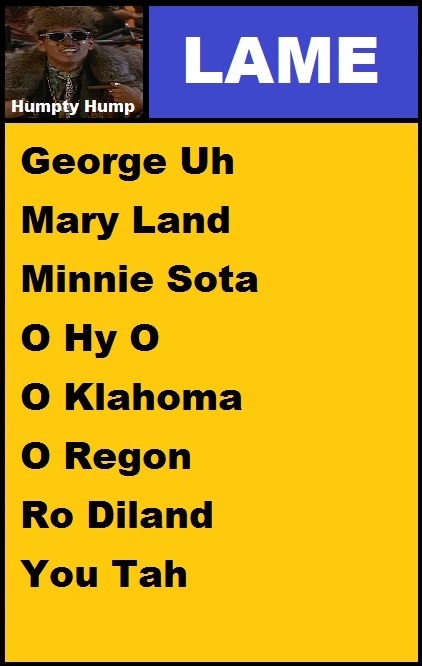 Some of the names just didn’t work- what do you do with Hawaii? Here is the best of the rest. It doesn’t stop at lame rap names either. I am not a fan of the NCAA. DO NOT make the typo that I once did and write “I am not a fan of the NAACP.” Trust me, it didn’t go well. But I am talking about college basketball. I already hate pro basketball (if a game ends 120 to 116, was it really necessary to play 4 quarters? This game could have been decided in 10 minutes) so why would I ever watch college? But to get back to my point, I am a college graduate. Granted, I graduated from the Earl Scheib School of “I’ll paint any car for just $99.95,” but even I know there is no such state as Golden State or Gonzaga State. Seriously, what’s up with that? I’d like to leave you with one of my favorite rap songs, from a rapper with a great rap name and who might have a mild brain disorder. I present, Bismark! Biz Markie! Some singers picked (or rather, producers picked) fake English names that sounded like Italian words, in a very dumb way. The most famous was Den Harrow (which, when pronounced with the Italian accent sounds like the word “denaro” – money. Another one was Joe Yellow, which sounded like “gioiello” – jewel, and so on. I could go on and on, but I’d better stop… sorry, I really love this stuff! Oops, sorry, I thought they would appear as links, not as video players, hope that doesn’t kill the bandwidth… the only one that appeared as a link is the best one, by the way click on it.